Fighting between troops from the Border Guard Force and renegade soldiers from the Democratic Karen Benevolent Army this week wounded four villagers. The armed clash took place between Kawt Nwe and Tadangu village near the new Kawkariek-Myawaddy Asia Highway on August 4. The breakaway DKBA troops were led by Lieutenant Na Ma Kyar and the BGF soldiers were from battalion 1017 based near the Asia Highway. The two sides exchanged both small and heavy weapons for half an hour and a shell hit a house in Tadangu village injuring the family of Saw Maung Ngo. The wounded villagers are Saw Maung Ngo, 47, his wife Naw Sallay, 40, his daughter Naw Gay Say, and his niece Naw Mu Toe. Saw Maung Ngo’s daughter, Naw Gay Say, an eight standard student was hit by shrapnel on her forehead and her condition was critical. Naw Hnin Yi, a village leader from Tandagu spoke to Karen News about the injured villagers. According to BGF sources, their soldiers led by Deputy Battalion Commander Major Saw Kyaw Naung was attacked by the former DKBA troops led by Lieutenant Na Ma Kyar and the shooting resulted in artillery shells hitting Tandangu village. Speaking to Karen News, the BGF’s Major Saw Kyaw Naung said. 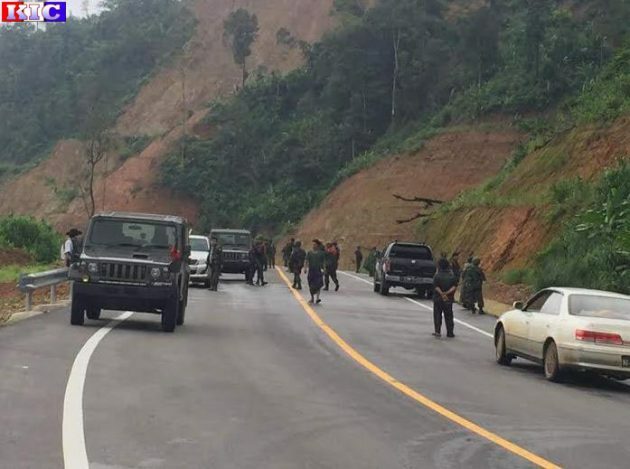 The fighting between the renegade L.t Na Ma Kyar group and local BGF troops have been a regular event in areas near the Kawkariek-Myawaddy Asia Highway for over a year after the BGF troops were put in-charge to secure the road in mid 2015.